At Lakehill Preparatory School we know that bigger is not always better. Lakehill is — and always has been — small by design. Our kindergarten through 12th grade school combines a strong, engaging academic program with a kind and inclusive community. We pride ourselves on nurturing students’ self-confidence in an inclusive, supportive environment. We make every child’s education personal, giving each student the greatest chance for success. A small student body offers a greater opportunity for each student to experience academic and leadership growth. This circle promotes a sense of belonging in students — a sense of pride in their community, their school and themselves. As a small school, Lakehill has built an atmosphere of respect, accountability, collaboration and mentoring between students and teachers. Embracing these values allows us to provide resources and learning opportunities that empower students to be architects of their own educational experience. This includes choosing from a variety of extracurricular activities, athletics, community service opportunities and much more. Each year we look to community supporters for donations that have an immediate and meaningful impact, keeping Lakehill the unique campus we know and love. A gift to Lakehill Prep makes a Big Impact — I encourage you to look around at our students and the difference they make in the community to see for yourself who the Annual Fund supports. It’s an investment in the leaders of tomorrow. The best way to learn about Lakehill is to stop by and visit for yourself. 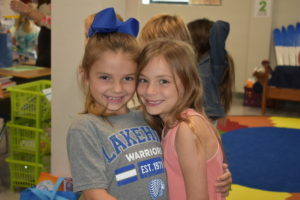 We encourage you to visit our website at lakehillprep.org, and come meet our students and staff to see if Lakehill might be a good fit for your student. Donate on North Texas Giving Day to make your donation to Lakehill Prep go further thanks to bonus funds secured by the Communities Foundation of Texas. Schedule your gift through Sept. 19, or join the frenzy of giving on Sept. 20 at northtexasgivingday.org/lakehill-preparatory-school.